The American Academy of Pediatrics suggests calling your child's doctor if your child has a sore throat that goes on for more than 1 day (no matter what other symptoms are present). Your doctor will do a physical exam. This involves looking closely at your mouth, throat, nose, ears, and the lymph nodes in your neck. Note: Aspirin is not recommended for children with a current or recent viral infection. Check with your doctor before giving your child aspirin. Note: Over the counter cough and cold medication should not be given to children under 4 years of age. This type of medication can cause serious life threatening problems in young children. Pharyngitis. EBSCO DynaMed Plus website. 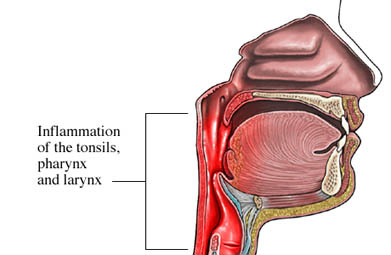 Available at: https://www.dynamed.com/topics/dmp~AN~T114913/Pharyngitis . Updated August 25, 2016. Accessed September 27, 2017. Sore throat. Family Doctor—American Academy of Family Physicians website. Available at: https://familydoctor.org/condition/sore-throat. Updated May 2014. Accessed September 27, 2017. The difference between a sore throat, strep and tonsillitis. Healthy Children—American Academy of Pediatrics website. Available at: https://www.healthychildren.org/English/health-issues/conditions/ear-nose-throat/Pages/The-Difference-Between-a-Sore-Throat-Strep-and-Tonsillitis.aspx. Updated February 26, 2016. Accessed September 27, 2017. Throat problems. Family Doctor—American Academy of Family Physicians website. Available at: https://familydoctor.org/symptom/throat-problems. Accessed September 27, 2017. Vincent MT, Celestin N, Hussain AN. Pharyngitis. Am Fam Physician. 2004;69(6):1465-1470. 11/10/2009 DynaMed Plus Systematic Literature Surveillance https://www.dynamed.com/topics/dmp~AN~T474266/Steroids-for-pharyngitis : Hayward G, Thompson M, Heneghan C, Perera R, Del Mar C, Glasziou P. Corticosteroids for pain relief in sore throat: Systematic review and meta-analysis. BMJ. 2009;339:b2976.